Sponsor for Air Cooled Condenser Annual Meeting | Chemtrac, Inc.
Chemtrac was a sponsor for the 6th Annual Air Cooled Condenser Users Group (ACCUG) Meeting. 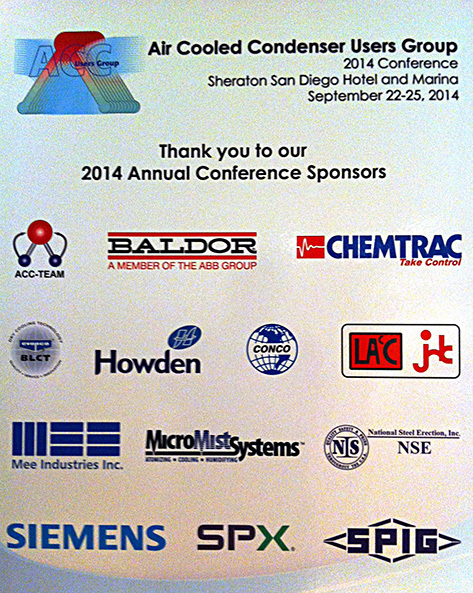 The conference took place at the Sheraton San Diego Hotel & Marina, September 22-25. There were 140 attendees from 12 countries. Dr. Andrew Howell of Xcel Energy has acted as the director of the annual meeting since its inception, and the Host Sponsor for this year’s meeting was Calpine Corporation. Since ACC units have significantly more metal surface area than conventional water-cooled condensers, corrosion monitoring in the steam cycle is of great importance to plant management. Chemtrac had thePC4400 Particle Counter and the PM2500 Particle Monitor on display, demonstrating their effectiveness for corrosion product transport monitoring in power plants. Steam cycle chemistry related presentations were given by Dr. Howell, Dr. Barry Dooley (one of the world’s top thought leaders on power plant steam cycle chemistry) of Structural Integrity, Steve Shulder of the Electric Power Research Institute (EPRI), as well as others from the power industry. A paper by Dr. Tian Wenhua of the Thermal Power Research Institute (TPRI) in China was also presented. In addition to the technical presentations, a tour of Calpine’s Otay Mesa power plant, with ACC dry cooling, was offered.